Life With 4 Boys: 10 Cool Ways to Beat the Summer Heat! 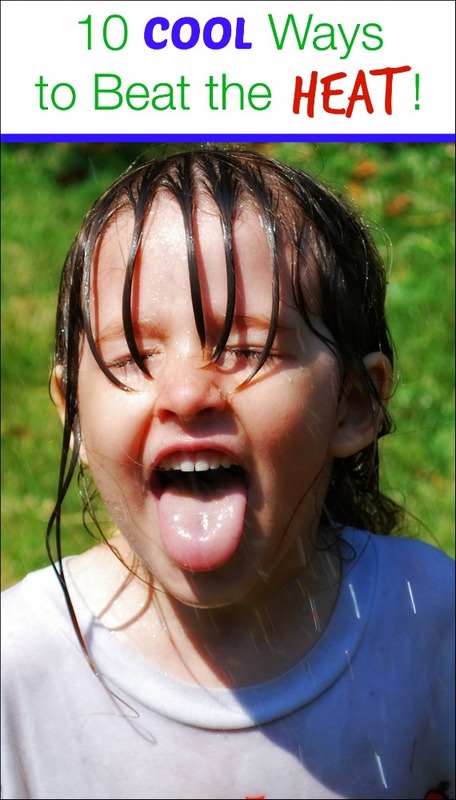 10 Cool Ways to Beat the Summer Heat! Summer is coming, and here in Florida, that means stifling hot temperatures and almost unbearable humidity at times. I know summer heat is not limited to Florida, it can be an issue all across the country. So, I started looking for ways to beat the heat and stay cool in the cummer. Some of the products below, like the Frogg Togg chilly pad and temperature cooling mattress pad, I already own and love. Others are products that I wish I could have, and a few were thrown in there just for fun. If you need a way to cool down this summer, this list is sure to have what you need! Frogg Togg Chilly Pad is an innovative way to keep cool during a workout, hard ride, tough climb or any other strenuous activity. When wet, the towel becomes considerably cooler than the outside air, thereby providing cooling relief to the user. When it stops cooling, simply re-wet the towel and wring it out. Machine washable. Small fan that can cool air up to 30F. This revolutionary evaporative cooling fan is the closest thing to a hand held mini air conditioner. Use it outdoors or keep it indoors as a desk fan. Provides gentle cool breeze. Uses evaporative cooling technology. Add water to soak the cooling filter. Ambient air is forced through the wet cooling filter and cools down. Works best in dry and hot climates. Fully portable and mobile, take it literally anywhere you want. Rotatable turbine wheel allows adjustment of the cool breeze of air. Humidifies air - makes breathing comfortable and alleviates allergies. This item was developed for three applications, 1) Industrial applications where managing core body temperature is paramount to worker safety and comfort. 2) To be used by theme parks and other venues to keep employees cool underneath mascot and character suits. 3) To provide relief to sufferers of Multiple Sclerosis who frequently experience heat sensitivity. Everyday uses include yard work, sporting events or anywhere combating heat is a must. The patented Black Ice cooler collars is a two-piece system worn on the neck. With a soft neoprene wrap and two detachable cooling packs that deliver regulated 57°F cooling with a quick 20 minute recharge, the CCX system provides refreshing, uninterrupted cooling so effective, you just have to feel it to believe it. Regardless if you are an "extreme" athlete, or your exercise regiment is a walk around the block - you will find this product a must have to keep you cool and comfortable. Cool on the Go is your own personal portable cooling device that provides you with a continuous stream of cool air that's perfect whether you're at home or on the go. Cool on the Go is versatile, hands free and runs on batteries, or USB (included), for powering versatility. COOL SHIRT Replacement Shirts All COOL SHIRTs Work with All COOL SHIRT Personal Cooling Systems Heavy duty 100% cotton, Flame Retardant NOMEX or Flame Retardant CarbonX COOL SHIRTs with over 50 feet of medical grade capillary tubing securely stitched to the front and back of the shirt. The worst part about summer is sleeping in the heat. This means, either putting up with the heat building up in your pillow as you toss and turn throughout the night or racking up the electricity bill by keeping the air conditioning on high all night. Now, with Gel'O Cool Mat, sleeping in the summer can actually be more enjoyable and less damaging to our pockets and our Earth. It's a Bird, it's a Plane - no, it's a wonderful new portable air conditioning unit. It looks small but will cool an 1800 sq. foot area. Just kidding. It WILL keep you cool under the hot sun. The solar panel needs to have direct exposure to the sun, and will work until you take it out of the sun. Awaken refreshed with active temperature management with Dreamaire Outlast technology. Traditional bedding traps heat and moisture that often cause sleep disturbances. Patented Outlast Thermocules intelligently absorb, store and release excess body hear for optimal thermal comfort. Outlast parented materials proactively maintain temperature balance to keep you dry and comfortable for a sound sleep Outlast Thermocules are based on Certified Space Technology engineered for NASA as an alternative to lofted insulation Outlast continuously tests and improve quality for fine lines around the world. I so use to have one of those fans but I put it up and it went bad because I didn't use it but it was great for football season. The cooling collar would have been so great for the kids in marching band practice! Great options, I love the collar! I would totally love to have that hat! Some of these are pretty interesting!!! I think the craziest one is that shirt, haha!!! Those Frogg Toggs look neat! Oh these are some great tips. Thanks so much! Ah yes, Minnesotan here and I know humidity. Thanks for the great info! Much as I hate cold weather, I'm not a fan of hot weather either. Not looking forward to hot, smothering heat in the Midwest. So, I'll have to keep some of these products in mind. We cool off at the pool. And I want a Gel'O Cool Mat! These are some great ways to beat the heat. Lots of new gadgets I haven't seen. As someone who has spent the last 31 summers of her life in 115+ temperatures, all of these inventions rock. We could especially benefit from the cooling mattress pad!